Xero for us is all about saving our customers’ time in a really intuitive, stylish and professional way. Many customers might already be using Xero or a similar cloud accounts system but few are really getting the most of it, is it actually producing your accounts? or just for sales invoicing? Use our expertise to get the most out of Xero, we could go on and on for hours about why you should but these are some of our favourite features. Xero operates a perpetual accounting system meaning no more complex month-end, year-end procedures. All the information is available to both you and your accountant in real-time moving you out of 12-month panic and catch-up paperwork cycles into a smooth ongoing cycle so you know where you are at any point in time. 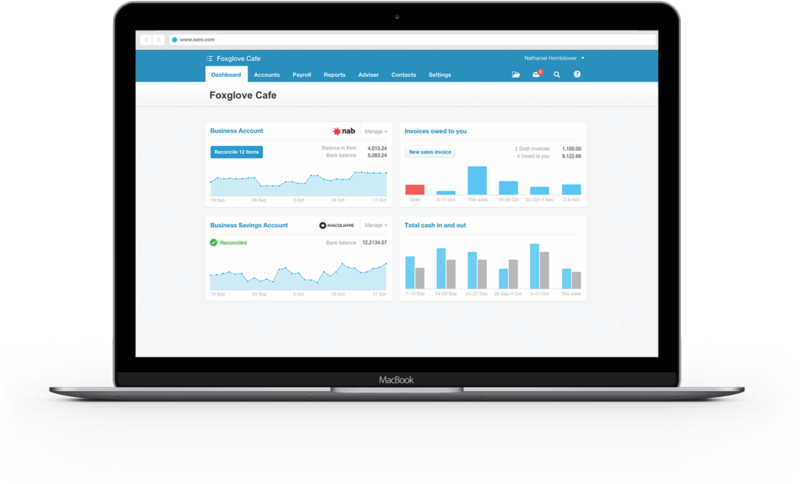 Xero connects to almost all UK banks, PayPal and stripe so live feeds keep your business information up to date ready for us (or you) to reconcile on a daily basis. We love rules! For regular bank transactions such as direct debits, charges and loan payments set a rule which will automatically pre-code the transaction and if not Xero will remember what you coded similar transactions to before have a suggested code and VAT rate ready for you to click OK. You will speed through the bank reconciliation in no time compared to traditional accounting software. Let us create beautiful sales invoice and quote templates tailored exactly to how you want them to look, you can have multiple templates so you can decide exactly how you want your documents to look and to which customers. Speed up your sales functions dramatically, inventory can monitor and track regular products or even just save you typing if you always use the same wording. Xero has an integrated sales quoting system so enquiries can be dealt with from start to finish, giving you an up to date enquiry register at all times and quotes can be converted to sales invoices at the click of a button. If you have different departments or perhaps wanted to track your business by brand, territory or against projects. Xero has two tracking options so that all sales and expenses can be tracked individually and you can run profit and loss or other reports specifically on projects or departments or look at the business as a whole. See your business in a new light as you want it wherever you are. Compare month to month, quarter to quarter, year to year Xero has all the regular reports you will want profit and loss, balance sheet, aged debtors & creditors and many more. We will create and tweak these reports until they are laid out the way you want them, meaningful for you and your business. Just click on the numbers and Xero will drill down to the detail. Simple ideas are the best, attach multiple documents to sales or purchase invoice transactions, copy invoices, terms, quotes; they are all there where you want them to view on screen or download. Setup as many users as you want on Xero, there are four levels of authorisation so staff will only get to access the areas they need to and only see the bits you want them to see. There are over 500+ apps that integrate with Xero from online payments via Stripe, Gocardless and PayPal, Receipt Bank for automated bookkeeping, Insightly, Capsule, Harvest, G suite, TSheets, MinuteDock, Chaser, Float and many many many more. For some reason accountants seem to like keeping fixed assets in a separate spreadsheet completely detached from your accounts. Stuff that, Xero fixed asset register is superb and integrates it in the accounts for us from additions to disposals to monthly depreciation. Behind the scenes there are so many clever features for us that once switched from traditional accounting software we have never looked back. We won’t explain all the magic that’s in there but all of this saves us time and therefore keeps your costs down. Win win, (we almost want to put a third win in there just because it’s so great) enough said. and don’t forget we will set it all up for you, manage the subscription as part of your accountancy package and implement a seamless changeover for a brighter business future.